Sweet Itch is an allergic skin condition in horses due to the saliva of biting midges. This is usually more common in the UK during the warmer months. The protein molecules within the midges saliva causes an immune response or reaction on the skin of the horse. This reaction can vary between individual horses and naturally there is a varying range of treatments. The best treatment is preventative action, however should you have any concerns you should always make contact with an equine specialist veterinarian. Confirm the nature of your horse’s skin complaint. 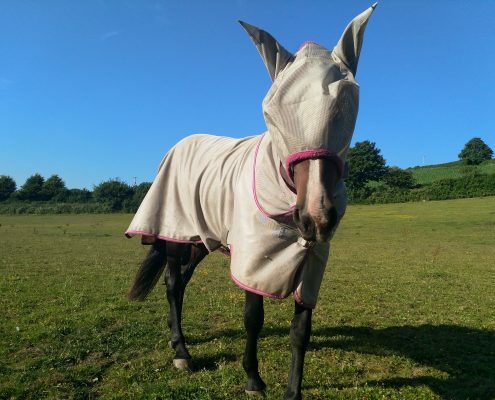 There are a large number of causes of equine skin diseases, such as fungal (ringworm), bacterial (rainscald), parasitic (lice, mange), as well as allergic reactions to bedding, insect bites, dust mites and pollens. If you are in doubt or need help to diagnose your horses condition please call the team at South Moor Equine for further advice 01548 830210. Use insect repellents or insecticidal sprays such as Switch or Deosect regularly to reduce attack from biting insects. These contain permethrin, making them very effective, and can be bought from the practice. 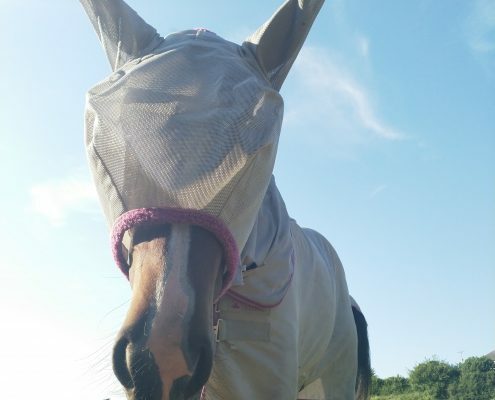 Use a fly sheet to help avoid contact with the biting insects. Ones with attached head masks and belly protection can be useful in more affected horses. Install a fan in the stable – midges can’t fly in wind speeds over 5mph. Apply a fly screen to the stable door and windows. Use topical oils to discourage midges and black flies from landing on the skin and feeding many people swear by the original formula Avon Skin So Soft, (which will also help protect you from those pesky horse flies). Move your horse to a windy hillside where biting insects tend to avoid. Don’t keep your horse near watercourses and trees, where there are high numbers of biting insects. Stable your horse at dawn and dusk when it is open to attack from biting insects. Only rely on corticosteroids as a last result because of the risk of setting off laminitis.